Today’s guest blog is by Dawn Lajeunesse, author of Autumn Colors. The climb seemed to take forever. Just when it looked like the ridge up ahead had to be the top, another stretch of trail through ever-thinning forest greeted them. They stopped several times to share trail mix and water. At first Kerry refused to eat, thinking of the calories in the M & M, raisin, nuts and coconut combo. She had to fit into her gown, after all. A few hours into the hike, though, that concern evaporated with her fading energy. They were doing some hand-over-hand climbing then. They emerged from one section into open space and a cold wind blew through them. Tom waited for her to catch up with him. Placing his hand on her shoulder, he pointed to a barren crop of rock up ahead. There already was an impressive view off to one side, but they pushed on for the climax of the trip. She was exhausted, but the panorama before her was what took her breath away. They had climbed a mountain together and looked out at the world at their feet. It would be hard to top this. Kerry sighed happily as she fell into bed that night after Tom brought her home. Her life with Tom kept getting better and better. I was introduced to the high peak area of the Adirondacks as a young child. My cousins had a rustic camp on Otter Pond outside of Newcomb, and we were invited there many summers. But I fell in love with the Adirondack Mountains – and mountains and forests in general – at the same time I fell for my first real love. He was a man of many talents and interests, brilliant, athletic, sensitive and destined for great things. Unfortunately, an accident took his life when we were only 23. He became the inspiration for the Tom character in my first novel, Autumn Colors. The bug had bitten, and my love of the Adirondacks and the outdoors lived on and expanded. As I moved forward in life, the man who eventually became my husband had been bitten years before by the same bug. Our earliest “dates” were spent in various Adirondack settings – paddling meandering mountain rivers, camping on the islands of Indian Lake, climbing many of the Adirondack peaks, cross country skiing around Lake Placid and Speculator. Although we took vacations to more exotic places like the Caribbean and Hawaii, our hearts were in the Adirondacks. I always knew that when I wrote my first novel, the mountains would be there. The property was five wooded acres that included a large, spring-fed pond. Their new home was designed to both blend in with the natural surroundings and allow them to feel like they were immersed in and part of nature. Out of sight and view of the road, they used lots of glass, wood, and stone, and designed the house to embrace the forest around them. They could sit on their deck or in their great room and watch the wildlife drinking at the pond’s edge and ducks swimming with their babies, occasionally diving for dinner. Fish of various sizes sporadically hurdled out of the water in an arc in pursuit of the insects dancing on the water’s surface, concentric rings radiating at the spot where they returned to the deep. The ducks climbed out onto their dock sometimes and fluffed their feathers to dry in the warm sun. Thirsty deer were silhouettes against the rising sun and grazed peacefully in the shade of stately pines and spruce most evenings. It wasn’t unusual to look out any window at dusk or dawn and see a black bear foraging, ambling along just beyond the edge of the forest. Raccoons were a frequent source of annoyance and amusement – they kept their garbage in a locked and hopefully impenetrable bin. And of course, squirrels and chipmunks abounded. While most of our friends gradually got away from hiking and paddling and cross country skiing as the decades progressed, we continue to do as much as our time permits. We refuse to allow aging bodies to stop us, although climbing a high peak takes a bit longer than it once did. We still meet up with one couple several times a year for seasonal outings. 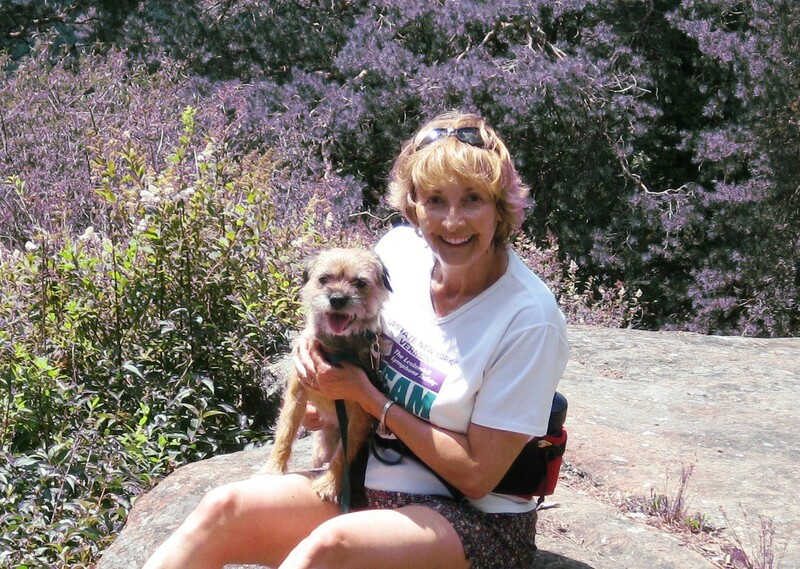 But many times it’s just us and our energetic Border Terrier, Nala, who loves the woods and hiking almost more than us, if that’s possible. My connection with the Adirondacks is almost a spiritual one. From one end of the six million acre Adirondack Park to the other, the terrain and flora change, but the atmosphere, the aura, remain the same. In the late nineties my husband and I bought a camp in anticipation of moving to the Adirondacks (from the Albany NY area) after retirement. We chose a location in the southern Adirondacks to be more accessible to health care and jobs if we needed them. After a few years we converted the camp to a year round home. Thanks to the less than ideal economy, we both still work, but we look forward to more leisure time for enjoying this pristine setting. Meanwhile, I expect our Adirondack living experience will continue to appear in my books. A big thank you to Dawn for sharing this guest blog about the Adirondacks. To read more of the story placed in this setting, be sure to click the links above or go to www.dawnlajeunesse.com!